A Pulitzer Prize–winning journalist takes readers on a surprising tour of the world of garbage. Take a journey inside the secret world of our biggest export, our most prodigious product, and our greatest legacy: our trash. It’s the biggest thing we make: The average American is on track to produce a whopping 102 tons of garbage across a lifetime, $50 billion in squandered riches rolled to the curb each year, more than that produced by any other people in the world. But that trash doesn’t just magically disappear; our bins are merely the starting point for a strange, impressive, mysterious, and costly journey that may also represent the greatest untapped opportunity of the century. 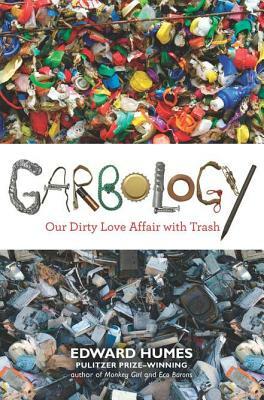 In Garbology, Pulitzer Prize–winning author Edward Humes investigates the trail of that 102 tons of trash—what’s in it; how much we pay for it; how we manage to create so much of it; and how some families, communities, and even nations are finding a way back from waste to discover a new kind of prosperity. Along the way , he introduces a collection of garbage denizens unlike anyone you’ve ever met: the trash-tracking detectives of MIT, the bulldozer-driving sanitation workers building Los Angeles’ immense Garbage Mountain landfill, the artists in residence at San Francisco’s dump, and the family whose annual trash output fills not a dumpster or a trash can, but a single mason jar. Garbology digs through our epic piles of trash to reveal not just what we throw away, but who we are and where our society is headed. Are we destined to remain the country whose number-one export is scrap—America as China’s trash compactor—or will the country that invented the disposable economy pioneer a new and less wasteful path? The real secret at the heart of Garbology may well be the potential for a happy ending buried in our landfill. Waste, Humes writes, is the one environmental and economic harm that ordinary working Americans have the power to change—and prosper in the process. Edward Humes is a Pulitzer Prize-winning journalist and author whose eleven previous books include "Force of Nature," "Eco Barons," and the PEN Award-winning "No Matter How Loud I Shout." He lives in Seal Beach, California. "Humes's argument isn't a castigation of litterbugs. It's a persuasive and sometimes astonishing indictment of an economy that's become inextricably linked to the increasing consumption of cheap, disposable stuff—ultimately to our own economic, political, and yes, environmental peril... his arguments for the rank inefficiency of our trash-happy, terminally obsolescent economy are spot on."